Numbers are important not just to scientists but to everyone since numbers affect social and economic aspects of our lives. Numbers contain information and obviously, wrong numbers contain misinformation. Mistakes do happen and we can be careless with numbers. Amnesty Philippines recently twitted, "President Duterte's invitation to host a human rights summit in the Philippines does not erase the 13M deaths..." An erratum was posted days later stating, "On Amnesty International Philippines' official Facebook and Twitter accounts, the post regarding deaths under the 'war on drugs' was incorrectly written as 13M. The correct post should read 13K." Okay, "M" does lie close to "K" on a computer keyboard. So, it could be an honest mistake. Still, with thoughtful reflection, 13000 deaths under the "war on drugs" is still a gross assumption. It therefore remains a misinformation. Another recent example is from the Washington Post. The Grade captured a news article last week that incorrectly states how much teachers spend on their own to support learning in their classrooms. The reporter, Moriah Balingit, later corrected the article. The link address to the article still bears the original $1000 figure. So, I guess everything is really not corrected. Similar to the error made by Amnesty International Philippines, Balingit also made a mistake that goes much farther than the numbers. 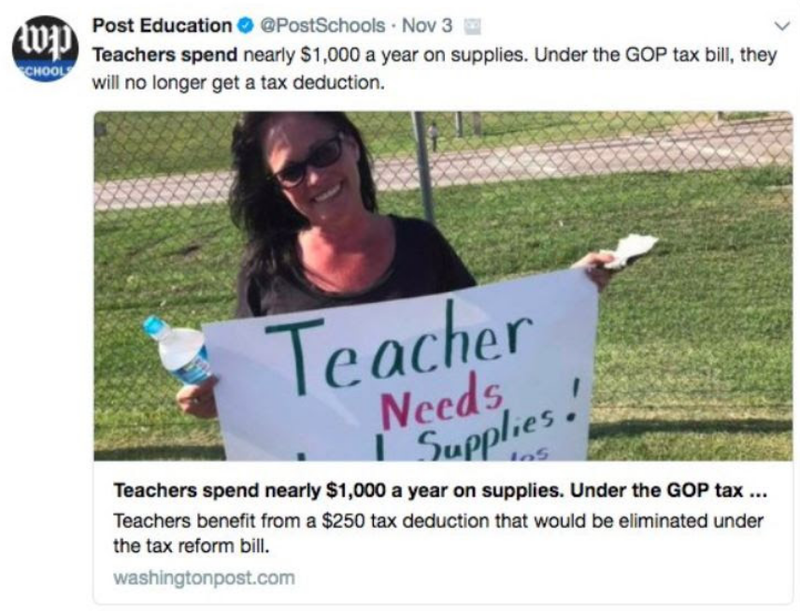 The current rule states, "If you're an eligible educator, you can deduct up to $250 ($500 if married filing jointly and both spouses are eligible educators, but not more than $250 each) of unreimbursed trade or business expenses." The proposed tax bill in its current form eliminates this deduction. Since this is not a tax credit, an educator can therefore reduce his or her tax by about $50. Of course, $50 is still $50, but the article misses entirely the much more important point. Teachers should not be spending their own money to support learning in their classrooms. The Amnesty International numbers likewise do not correctly inform us. The number of extrajudicial killings (EJK's) in the Philippines under the Duterte administration is grossly misleading. These are alleged numbers. These have not been proven. Teachers in basic education spend a great deal of both time and effort teaching our children how to make sense out of numbers. These efforts are only wasted when we irresponsibly use numbers to misinform society.